This mini compressor with its 3.5 ltr tank is quiet and convenient for most applications including Spraying models, airbrush art, nail airbrushing, spray tanning and much more. It's compact and lightweight (under 10kg) and is designed for portability. 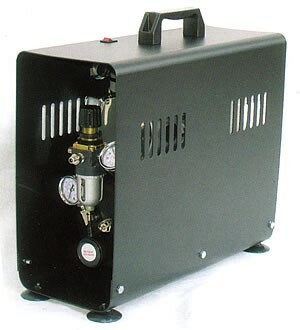 Ideal for the home, office and hobby workshop air brushing. This product was added to our catalog on 17/11/2011.